Q3 Technologies helped the client in developing an ERP application for a large manufacturer and retailer of gems and jewelry that helps in managing the day to day tasks efficiently and effectively. With all the features in a single unit, the application provides a highly secure and robust mode of operation. The client is a global company with manufacturing in China and India and sales operations in North America, and UK, and is a leader in the import, export, and manufacturing of high quality gems and jewelry across the globe. The client manufactures a large variety of diamonds that includes various shapes, colors, and clarity. Today, the client is one of the largest exporters of colored gemstones from India and also one of the largest exporters of studded jewelry. Like other different businesses, the online gems industry has begun the race for the greater piece of the pie, significantly later than their competitors, but without a doubt running substantially quicker. 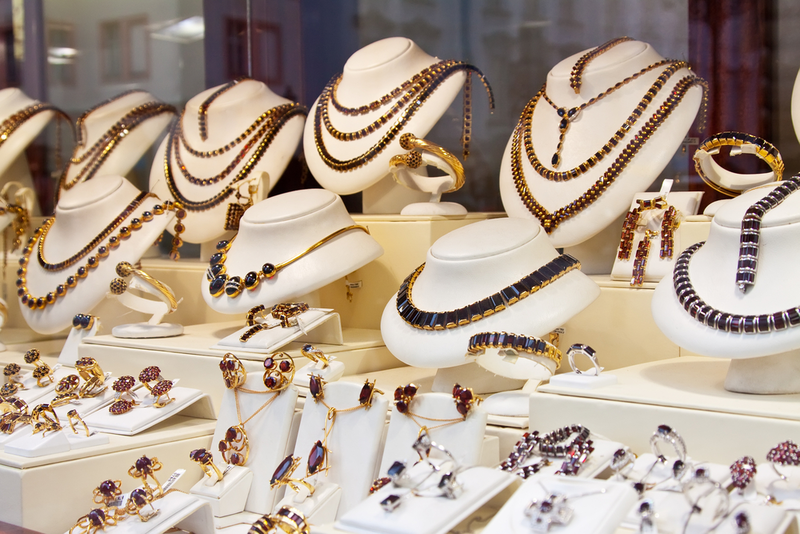 The global jewelry market is growing at a steady pace of 5% CAGR and is anticipated to achieve USD 257 billion by 2017. Asia Pacific has risen as the biggest jewels market filled with surging interest development in India and China, while USA still keeps on being the single greatest nation in the gems business. 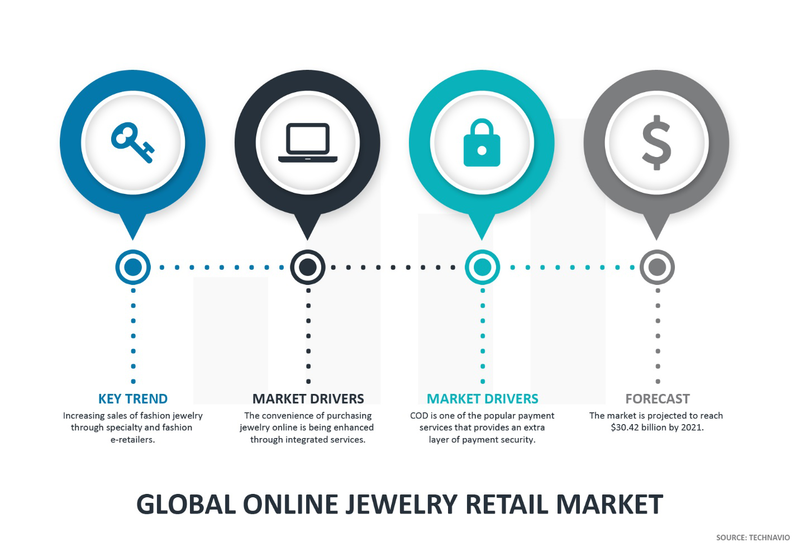 At present, the online jewel market constitutes 4-5% of the aggregate worldwide gems deals however is developing at significantly quicker rate and might bag 10% of the aggregate gems sales by 2020. Candace Cheung, senior director at eBay says web based shopping is the rising pattern in such products, with gems and watches among the best three things with quickest development in E-trade. Future expectations are also growing for online jewelry, particularly in India and China. Web based business in China is expected to develop at 25%, substantially speedier than the conventional retail , and US headquartered Blue Nile , the biggest worldwide online jewels supplier is benefiting from this. China is the market’s second greatest after US and timed 37% YoY development with USD 30 million in sales. The client wanted to transform and migrate their traditional windows desktop application. The primary users of this application were shop floor personnel, shift supervisors and production managers. Over a period of time, client realized that the windows desktop application was disadvantageous because the client needed to install or update the application to each and every system, where it was required to be accessed. This increased the operational and hardware cost of the client. In addition, due to unplanned enhancements and poorly designed functional top-ups that were carried out on the application had caused it to become sluggish and difficult to maintain and manage. The client’s broad objective was to eventually bring- in all their production, inventory, warehousing, sales and auction management systems under one roof and provide a single sign-on centralized system for their entire operations. Therefore, the client decided to go for a scalable web based solution in order to automate the entire process of operation and manage it from a single application. Q3 provided various functionalities of the application to meet the specific requirements of the client. Microsoft Silverlight technology was used in the application for rich graphical user interface and Windows Communication Foundation (WCF) was used for making the application service oriented. Another technique named Aspect Oriented Programming (AOP) was implemented in the application for loosely coupled code and for reusability purpose. In addition, our experts had implemented the Unity Framework (Dependency Injection). The dependency injection technology allowed the developers to inject objects into a class, rather than relying on the class to create the object itself and thus increased the performance and usability of the application. Our experts used Entity Framework, which allowed the application to be free from back-end database. Entity framework included a rich mapping engine that could handle real- world database schemas and worked well with stored procedures. This allowed the administrator to work with a variety of databases such as SQL server to Oracle and vice-versa. Moreover, enterprise library helped the application for logging in and exception handling. The application takes care of employee management all together from adding and editing to deletion of the employee. It also provides with the functionality of linking the employee (both worker and supervisor) to the corresponding stage. 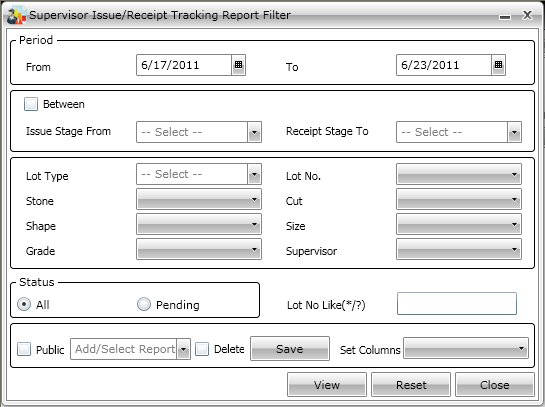 The application allows users to see various utility reports which are important to track the status of the application. It also allows users to view different types of items in the application. This helps users in many ways, such as a view of the list of logged in users and transaction and activity logs of the system. The application also allows users to view the activity logs of the system. The view may be further filtered using various filters such as, period, action performed (edit, add), and type of transactions. The application allows users to transfer finished gemstones to an inventory of gemstones automatically & generate lot-wise profitability and a variety of other powerful reports based on different views that help to analyze the operational health of the production process. This also allow users to receive goods as raw material, issue it to supervisors for processing at various stages/processes. “Ok” received goods are further gone through assortment process for quality control. This application also manages the tracking of inventory and its value at the various stages and levels. It allows user to view stock/inventory at any time with value and labor charges. 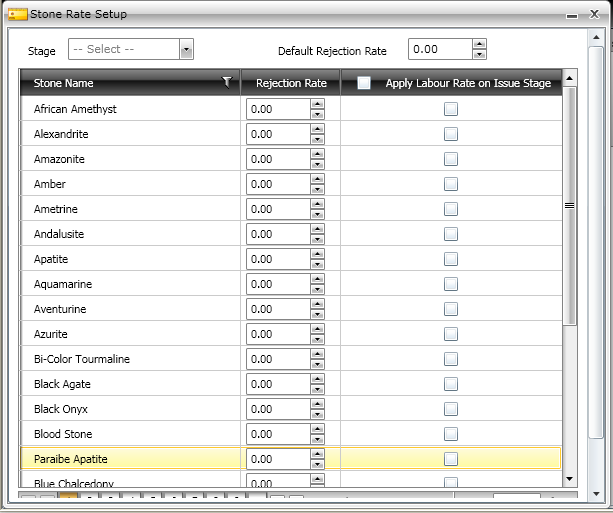 It allows user to define the worker rates for employees according to stones & stages. It allows user to generate the worker payment as per defined worker rates. It has customizable reports to view transaction wise tracking details and losses while production and lot wise summary report of production etc. The migrated system improved the performance of all the major work flows and report generation by leaps and bounds. Reports which used to consume almost 30 to 45 mns to get generated in the older system were taking as less as 1 min on the new system. Elimination of manual workflows reduced the time and manpower requirements and helps the client to manage the store with less maintenance cost. The centralized application provided the highly secure and robust mode of operation. A clean and rich web based system helps the shop- floor personnel in effectively managing their day-to-day tasks.